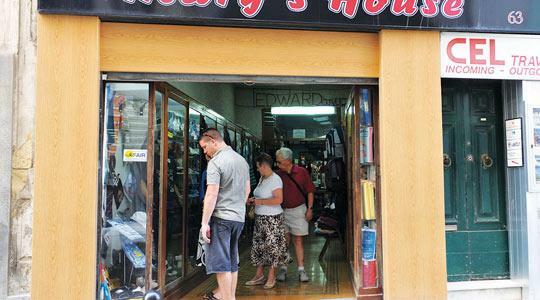 The Sliema shop which is believed to have sold the clothes in which the Lockerbie bomb was wrapped. Photo: Chris Sant Fournier. The government has been asked to support an international attempt to request the United Nations to conduct an inquiry into the Lockerbie bombing. The letter is signed by 20 people including the families of the victims, authors, journalists, professors, politicians and parliamentarians, as well as Archbishop Desmond Tutu - well-known for defending human rights worldwide. The government said it was considering the call for the inquiry. The letter asks the UN to help remove "many of the deep misgivings which persist in lingering over this (Lockerbie) tragedy". Such an effort could also eliminate the Malta connection with the terrorist act. Malta was brought into the case because the prosecution argued that Abdel Basset Al-Megrahi and Al-Amin Khalifa Fahima had placed the bomb on an Air Malta aircraft before it was transferred at Frankfurt airport to a feeder flight for Pan Am flight 103A which departed from London. The Pan Am 747 was bound for New York's JFK airport before exploding over Lockerbie in Scotland on December 21, 1988. All 259 people on board died as well as 11 locals on the ground. At the original trial in the Netherlands, Mr Al-Megrahi was found guilty and jailed for life while the other defendant was released. The second appeal of the convicted bomber, Mr Al-Megrahi, was expected to produce evidence that had not been made available at the trial and remove doubts that continue to linger on the verdict. But Mr Al-Megrahi, who is terminally ill, was released from Scottish prison in August on compassionate grounds and abandoned his appeal to return to Libya. The convicted bomber has always maintained his innocence. In a bid to clear his name before he succumbs to cancer, he began publishing documents that were to have featured in the appeal on the website www.megrahimystory.net. The papers, he insists, provided enough grounds to have secured his release on appeal, if it had not been dropped. The first 300-odd pages of documents refer to Malta and the testimony of Maltese shopkeeper Tony Gauci. Mr Gauci had identified Mr Al-Megrahi as the man who bought the clothes from his shop in Sliema that were later found wrapped around the bomb. But, according to the documents, Mr Gauci's testimony was replete with inconsistencies. Moreover, the published documents state that Mr Gauci was paid "in excess of $2 million", while his brother, Paul Gauci was paid "in excess of $1 million" for their co-operation. Sky News reported last Friday that Tony Gauci was now living in luxury in Australia. The payment had not been disclosed at the original trial, nor had the documents related to it. Excerpts from interviews conducted for the case that were revealed in the published documents quote former Police Commissioner George Grech and the former Head of the Security Services Godfrey Scicluna saying they were of the opinion that Tony Gauci "had become confused about things". Yet, statements by representatives of the highest government authorities in Malta at the time were overruled in favour of Tony Gauci's testimony. Another witness, David Wright, a regular visitor to Malta and friend of Tony Gauci, also filed a statement with the police in the UK saying that he was at the shop when the clothes were bought and that Mr Al-Megrahi was not the buyer. Yet, he was never called to testify. Foreign Affairs Minister Tonio Borg yesterday told The Sunday Times: "Since 1988, successive governments have insisted that according to our records, the bomb did not leave Malta. We are still firm in that conviction." While more papers are to be released by Mr Al-Megrahi tomorrow and over the coming weeks, the last batch are intended to show the overall case against Mr Al-Megrahi was "inherently weak", that it had relied upon "circumstantial evidence... made up of various strands which did not fit together sufficiently coherently and were not substantial enough to carry the weight of a guilty verdict" and that there were "yawning gaps in the picture painted by the trial court". Dr Borg said the letter to the UN requesting an inquiry was an interesting development that would be "deeply" considered, although he referred to complex issues surrounding the event. "We cannot ignore that there were two judgments on Mr Al-Megrahi. The fact that the second appeal was initiated does show that doubts persist on the verdicts. Unfortunately, it was not concluded," Dr Borg added. Hans Koechler, who was handpicked by the then UN Secretary-General Kofi Annan to monitor proceedings, said in his report following the original verdict that a "miscarriage of justice had occurred". Dr Koechler told The Sunday Times that oil interests and joint security considerations have prevented the truth from emerging. The sentiment that political interests dominated the trial is echoed by Robert Black, the legal expert who was the architect of the original trial. He is one of the signatories to the letter demanding a full public inquiry.